Methylphenidate (Ritalin®) is commonly prescribed for behavioral problems associated with attention deficit/hyperactivity disorder (ADHD). 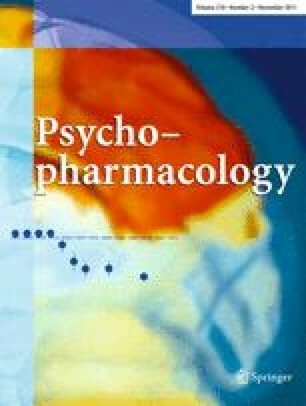 The results of previous studies suggest that methylphenidate increases cigarette smoking in participants without psychiatric diagnoses. Whether methylphenidate increases cigarette smoking in participants diagnosed with ADHD is unknown. In this within-subjects, repeated measures experiment, the acute effects of a range of doses of methylphenidate (10, 20, and 40 mg) and placebo were assessed in nine cigarette smokers who were not attempting to quit and met diagnostic criteria for ADHD but no other Axis I psychiatric disorders other than nicotine dependence. Each dose of methylphenidate was tested once while placebo was tested twice. One hour after ingesting drug, participants were allowed to smoke ad libitum for 4 h. Measures of smoking included total cigarettes smoked, total puffs, and carbon monoxide levels. Snacks and decaffeinated drinks were available ad libitum; caloric intake during the 4-h smoking session was calculated. Methylphenidate increased the total number of cigarettes smoked, total number of puffs, and carbon monoxide levels. Methylphenidate decreased the number of food items consumed and caloric intake. The results of this experiment suggest that acutely administered methylphenidate increases cigarette smoking in participants with ADHD, which is concordant with findings from previous studies that tested healthy young adults. These data indicate that clinicians may need to consider non-stimulant options or counsel their patients before starting methylphenidate when managing ADHD-diagnosed individuals who smoke. The authors wish to thank Frances P. Wagner, R.N. for her expert nursing assistance and Amanda Bucher, Kathryn Hays, Shawn England, Michelle Gray, Erika Pike, and Sarah Veenema for their expert technical assistance. The National Institute on Drug Abuse Grants R01 DA 012665 (CRR) and T32 DA 007027-34 as well as the National Cancer institute grant R21 CA 124881 (WWS) supported this project. Research professorship funds from the University of Kentucky to CRR, startup funds from the University of Kentucky Department of Behavioral Science to WWS, and pilot grant funds from the University of Kentucky Department of Behavioral Science to ARV also supported this project.